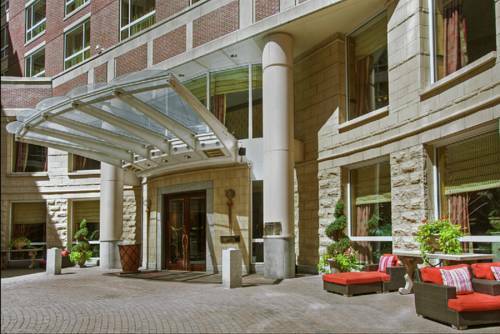 The Kimpton Marlowe Hotel a luxury boutique hotel combines contemporary style and neoclassical architecture is perfectly nestled in the heart of Cambridge near the banks of the Charles River and only moments from downtown Boston. Home to MIT Harvard the Museum of Science high-tech and bio-tech centers and Faneuil Hall TD Garden Newbury Street and Logan Airport. The hotel conveniently places the business or leisure traveler minutes away from key areas of interest. The Kimpton Marlowe combines soothing accommodations with a playful mixture of styles. Rich golds crimson reds and deep blues mix with details like plush velvet fabrics and high-end finishes making for ideal Cambridge accommodations. Alexis B: The elegantly decorated Alexis Gallery holds up to 150 people, depending on the configuration. An ideal choice for a reception, a reunion, or a large conference. Alexis A: The elegantly decorated Alexis Gallery holds up to 150 people, depending on the configuration. An ideal choice for a reception, a reunion, or a large conference. Alexis Gallery: The elegantly decorated Alexis Gallery holds up to 150 people depending on the configuration. An ideal choice for a reception, a reunion or a large conference. A Cambridge hotel the Hotel Marlowe is the latest addition to this beloved Massachusetts town. Separated from Boston by the Charles River yet linked to Boston by eight bridges Cambridge is often identified with Harvard and MIT. Indeed both world-famous campuses shape Cambridges personality. With people from all over the world mingling in Harvard Square Cambridge is a Mecca for seekers of knowledge innovation culture and diversity.